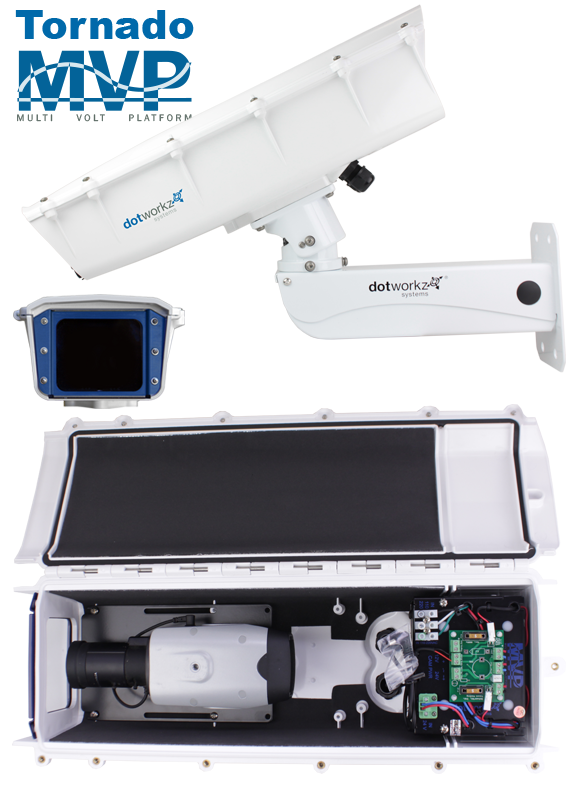 The Dotworkz S-Type 4K Series camera housing is engineered for optimal camera performance and reliability with Broadcast, 4K ultra high definition security video, long range marine video, and other high value applications. 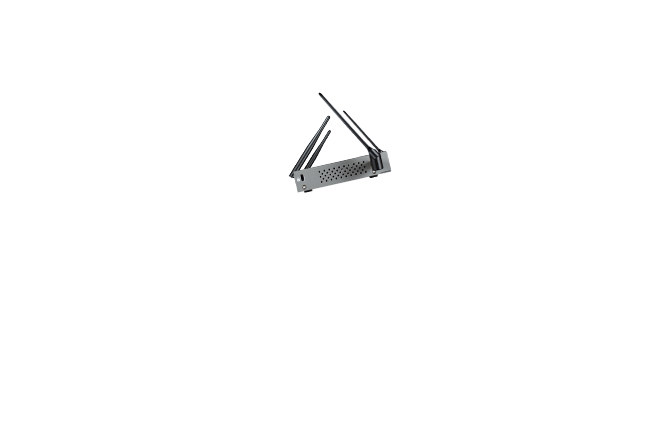 Stabilized stainless steel arm and IP66 camera housing for long range video applications, thermal, static, fixed, and other brick style cameras. 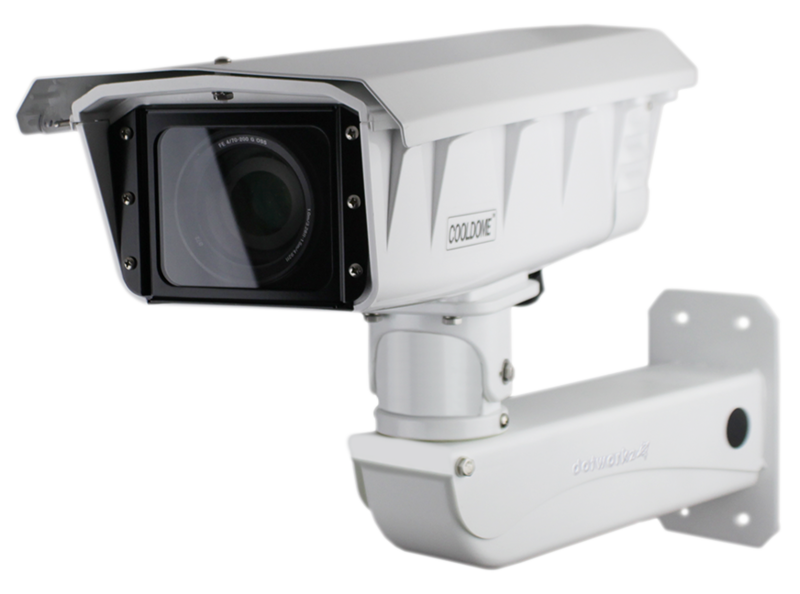 The S-Type professional grade outdoor video surveillance protection system is optimized for high performance static video cameras, including the latest precision HD/megapixel network based systems. The S-Type has options that couples internal active environmental control technologies with extra heavy duty construction, all at affordable prices. The S-Type comes will heavy duty wall mount bracket and is ready for installation. 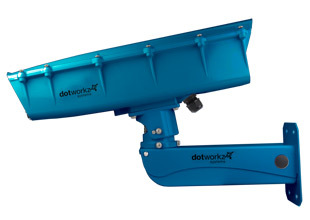 The Dotworkz USA made S-Type is the next generation platform offering stabilized, long life, trouble free, and IP66 no compromise camera housing solution for surveillance video projects that simply cannot afford failure or to be impeded due to summer heat, ice build up or vandalism. 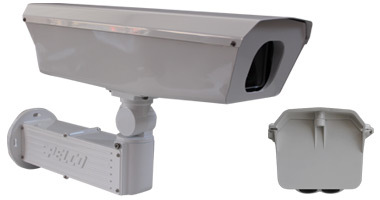 Non corrosive high impact thermoplastic outer shell allows for extra room to protect CCTV or IP fixed camera models, wireless radios, networking products, 3G/4G routers, or NVRs to be installed in a single airtight and temperature controlled enclosure. Thermo, Ballistic, Polarized, Borosilicate, Germanium, Clear, and Tinted Lens Options. Perfect for OEM, Specialty Applications, and More. Our COOLDOME ™ product line provides the ultimate solution to extremely hot climates such as deserts and extremely sunny areas. Every COOLDOME™ product can protect your camera and equipment from climate temperatures that can reach 167 degrees F / 75 degrees C. Our trusted 3 Stage Temperature Stabilization System is the reason why no other company can match our protection level for your camera and equipment against the all temperature environments. Most cameras shut down in extreme heat leaving an area vulnerable without video surveillance (Click here to see what happens when a camera fails under extreme hot climate). The COOLDOME™ keeps cameras operating flawlessly, even when subjected to soaring temperatures and direct sunlight. The solid state cooling system and high-flow fans remove heat without air exchange into the sealed housing, thus controlling humidity that can cause lens fogging and component corrosion. The COOLDOME™ turns off and on automatically at set temperature thresholds to generate up to a 45° F differential with the outside environment. In addition to preventing thermal shutdown, the lower temperature reduces wear on moving parts as well as damage to mounted wireless components, cell routers, and hard drives. For more than 13 years, COOLDOME™ has been used in a variety of mission critical applications, including NASA, Military, Police Departments, Casinos, Dams and border security operations. Up to 167° F (75° C) protection & Up to a 45° F differential temperature from outside the COOLDOME™ housing. 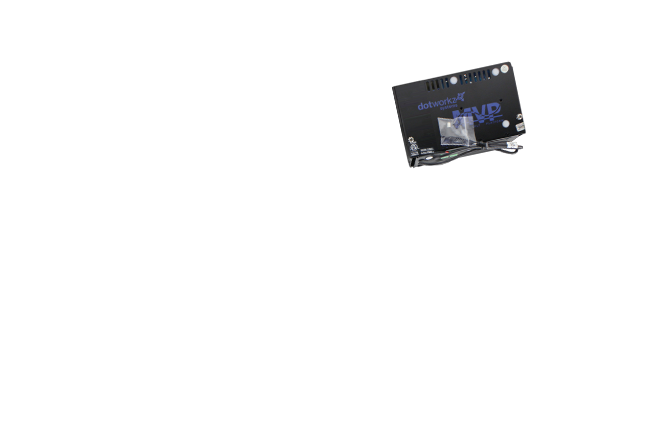 Ideal for Broadcast, Security, CCTV, HD, and 4K Cameras as the controlled climate inside the enclosure allows the camera to operate at it’s desired temperature with no risk to overheating equipment. Our Ring of Fire product line provides the ultimate solution to extremely cold climates such as the arctic and mountainous areas. Every Ring of Fire product can protect your camera and equipment from climate temperatures that can drop down to -60 degrees F / -51 degrees C. Our trusted 3 Stage Temperature Stabilization System is the reason why no other company can match our protection level for your camera and equipment against the all temperature environments. The Dotworkz environmental housings brings unsurpassed protection to surveillance cameras from the rigors of harsh outdoor environments, vandalism and physical damage. The Dotworkz Ring of Fire heated interior system will prevent cameras from freezing in climates down to -60°F (-51°C). Extreme cold takes extreme measures – count on the only enclosures with Ring of Fire thermal protection! By keeping cameras within their safe operating temperatures, the Ring of Fire extends camera life, allows full mobility of PTZ functions, plus keeps cold weather maintenance to a minimum. In addition, the thermostatically controlled heating system with its self-contained power supply can be customized for specialized environmental and equipment needs. Unlike traditional heated enclosures that normally fog up or ice over, the Ring of Fire features patented de-icing/defrosting circuitry that removes snow and ice that would obstruct the camera’s view. Plus, the Ring of Fire housing seals out all moisture, preventing lens condensation and fogging. 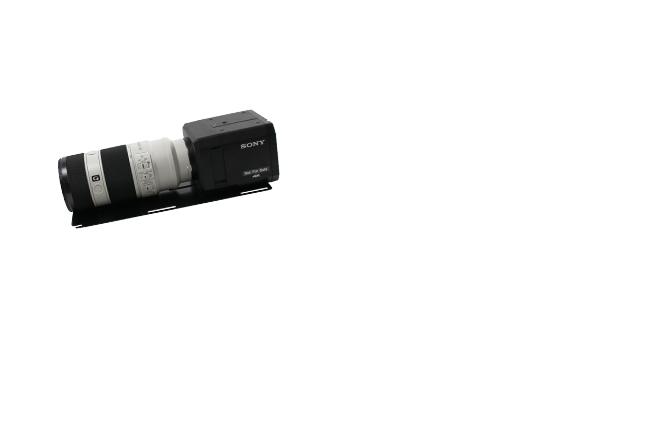 Providing consistent climate control assures peak performance of cameras in harsh weather conditions. The Ring of Fire is an essential solution for cameras installed at ski resorts, government facilities, northern border crossings, cell towers and other outdoor applications in cold regions. 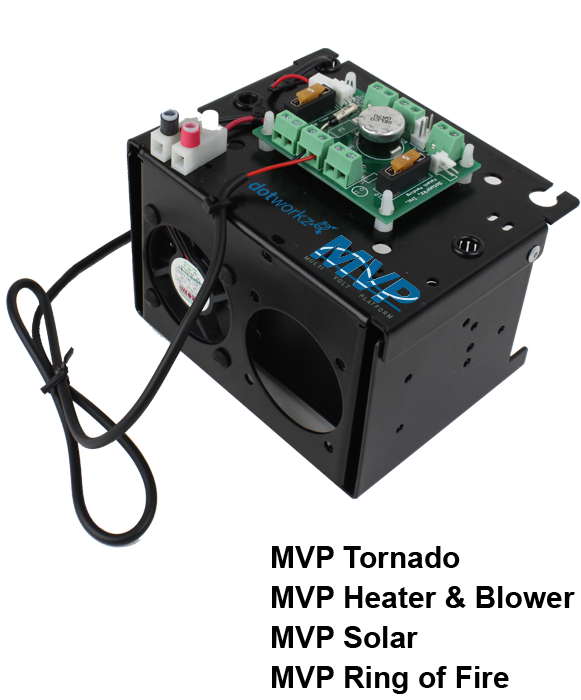 All Ring of Fire products have the MVP (Multi Volt Platform) as standard. 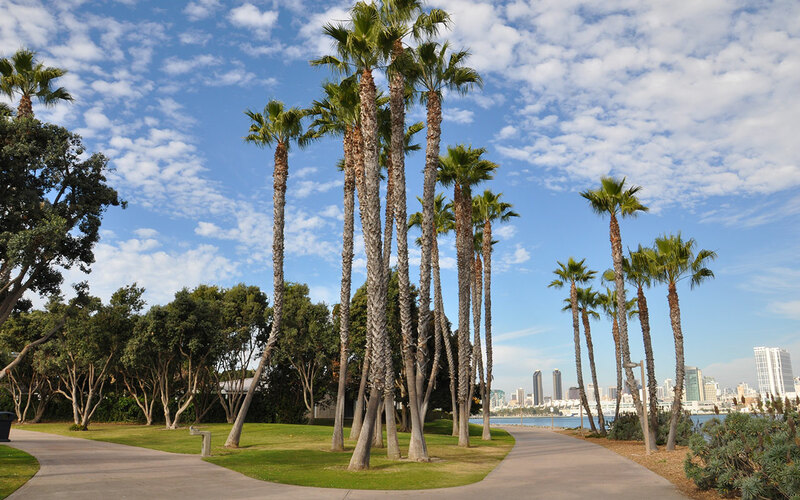 Our Tornado product line provides the ultimate solution to hot and humid climates such as ocean coastlines and even extremely hot and humid regions such as the Gulf Coast. Every Tornado product can protect your camera and equipment from climate temperatures that can reach 140 degrees F / 60 degrees C and Humidity levels of up 95%. Our trusted 3 Stage Temperature Stabilization System is the reason why no other company can match our protection level for your camera and equipment against the all temperature environments. Most cameras shut down in extreme heat leaving an area vulnerable without video surveillance (Click here to see what happens when a camera fails under extreme hot climate). The Tornado keeps cameras operating flawlessly, even when subjected to soaring temperatures and high humidity. The Tornado provides needed air flow circulation around the enclosed camera and sensitive hardware, significantly reducing hot-spot buildup when temperatures heat up. The Tornado operates at a max of 4 watts and delivers 20 CFM (Cubic Feet Per Minute) air movement where it’s needed most to keep cameras and components within their safe operational temperature range. In addition, the polycarbonate thermal plastic compound provides maximum IR reflection. Inside a reflective thermal blanket provides heat and EMI shielding for year-round peak performance. Excessive heat can damage cameras. 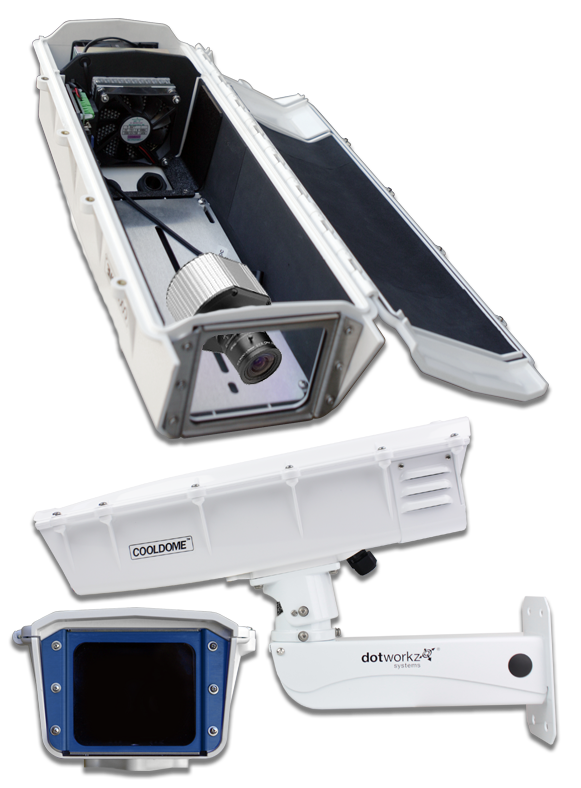 The ultimate barrier between the camera and outside heat, the Tornado D2 enclosure significantly reduces heat-related wear-and-tear. It is also tested to be water, dust and air tight. Creates a Tornado of continuously moving air inside the housing cooling the camera and equipment. 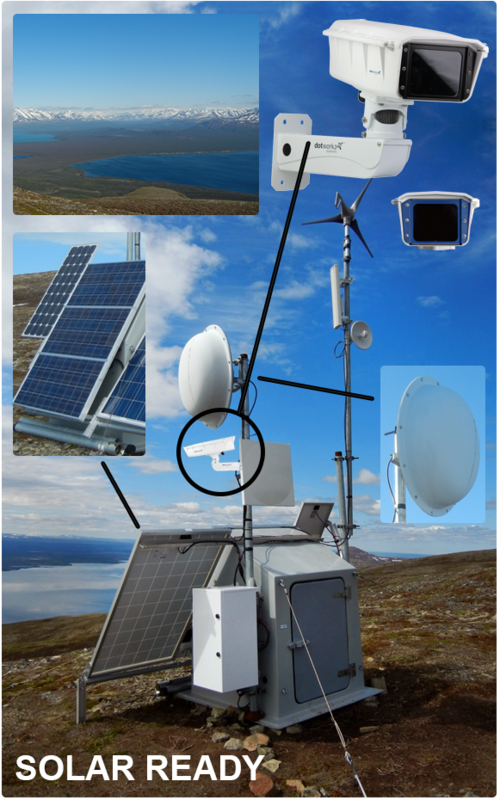 Remote power made simple with Dotworkz Solar Systems kits US made Solar Hardware Solutions designed specifically for the IP video industry. Dotworkz complete turn-key remote power solutions allow for both easy installation and reliable long-term performance, and have been engineered to protect and power sensitive remote video hardware that require a consistent remote power source. Our solar power systems are uniquely built for five days of autonomy, enabling our solutions to run without solar input during extended periods of harsh weather or extreme cloud cover. This is distinctive to the majority of solar hardware on the market which is sold for non-mission critical applications or as a backup power source. These generalized applications operate for only 24 hours without sunlight so corners can be cut in battery materials, life cycles and panel output. 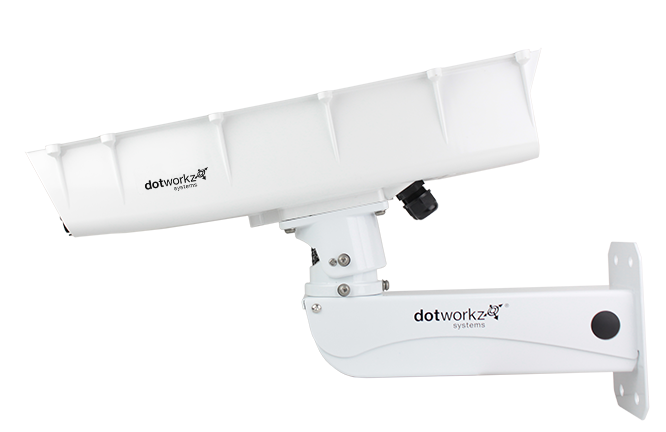 Dotworkz solutions are engineered with the ability to combine IP or analog security cameras, wireless radios, 3G/4G broadband network devices, NVR’s, fiber modems, and other essential electronics with our solar ready outdoor camera housings. 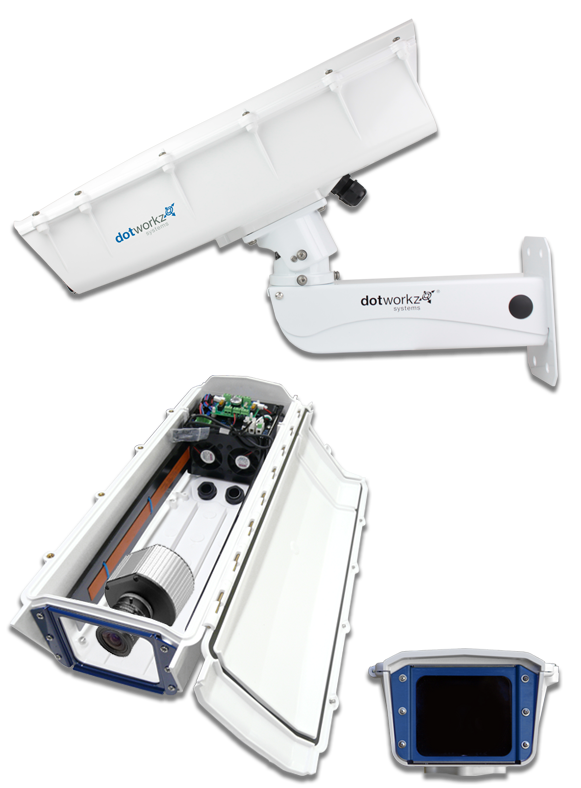 With 20 years of experience designing outdoor camera solutions, Dotworkz recognizes that using components of the highest proven quality is the only way to build true long-term reliability into our solar power packages. Each solution is custom engineered to insure maximum performance for your install location and video equipment draw. 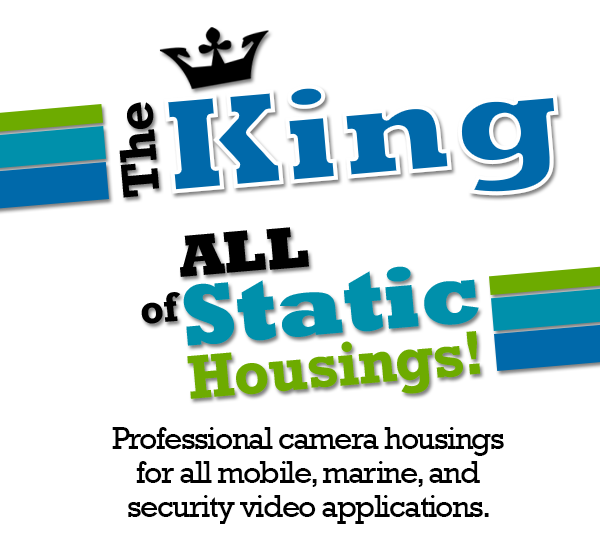 Our solar design staff is vastly knowledgeable in all camera brands (Pelco, Axis, Sony, Panasonic, Arecont, VideoIQ, etc.) and the specific processes required to power them efficiently. The connections within the battery/control box are plug and play, making set up simple and completely tool-free. Tools are only required if box and panels are to be mounted to a structure (pole, wall, beams, etc.). Free lifetime tech support and installation services (additional fees required) are available with this system. Simply let us know where you need power and what camera or cameras you will be using and our solar experts will design the correct system. 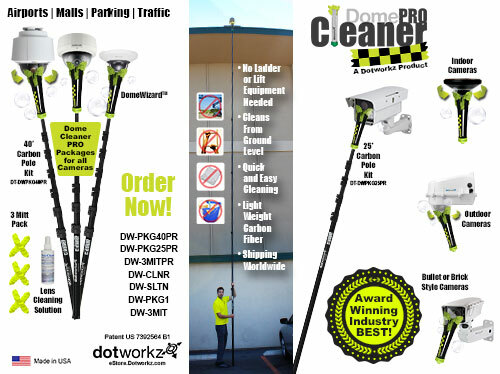 MVP Setup / Installation made EASY by Dotworkz Dotworkz Systems takes innovation to the next level with its Multi Volt Platform (MVP) power solution for site power and camera power compatibility making it almost universally compatible. The MVP system is designed to greatly simplify ordering and installation. 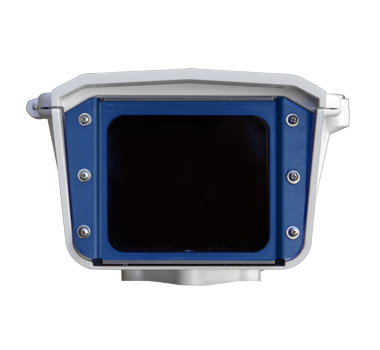 This system allows for multiple input voltage scenarios for stepping down to multiple camera voltage options in one “ready to install” unit, making it a professional grade outdoor camera setup that is simpler than ever. 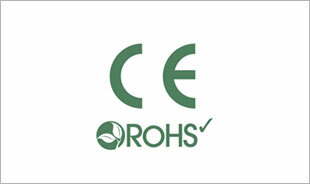 The MVP is standard for S-Type, D2 or D3 Heater Blower, Tornado, and Ring of Fire models. Click here to see our step by step installation guide. 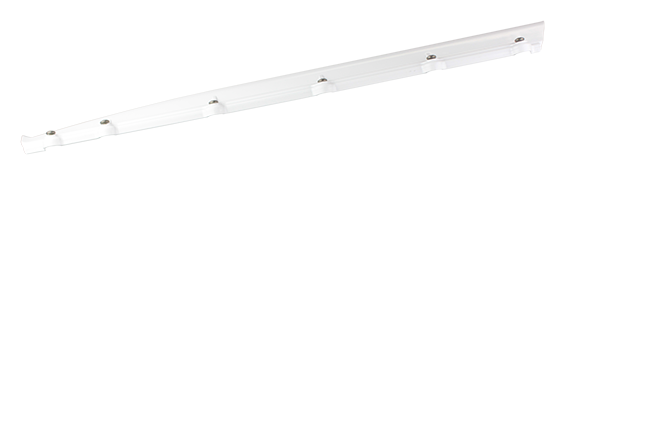 Light weight – Reduces swing weight (vibrations) when pole mounted to reduce camera movements and blurs. 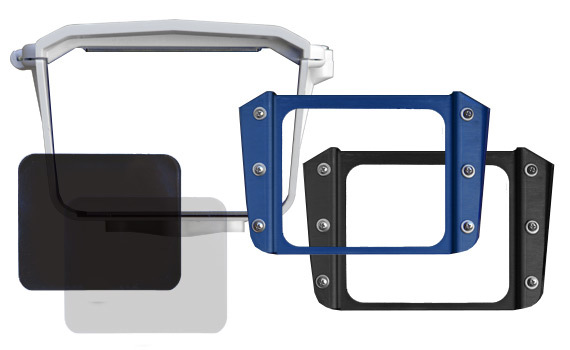 Wind proof arm system – Arm option proven to reduce camera movements thus improving recording clarity and usefulness. Impact resistant at all temperatures – Acts of vandalism including bullet impacts and rocks cannot crack or shatter our housings no matter what climate our housings face. Non metallic – Long life protection will not corrode, rust, or oxidize; Perfect for wet conditions including piers, bridges and boats. Our thermoplastic protects sensitive electronics from static discharge and bi-metal oxidation damage. 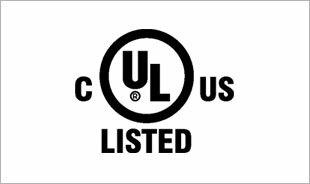 Recommended and approved – outdoor housing for extreme climates recommended and approved with all camera brands, including Axis, Pelco, Panasonic and Sony precision network cameras that require professional grade protection levels. 3G/4G ready – Simple integration of wireless routers and air card systems, including easy to use line out power connections inside our Multi Volt Platform or MVP system. Integrated Omni-antennae mount for quick and easy wireless integrations. Climate specific heating and cooling options- available with Active Cooling (COOLDOME™), De-icing (Ring of Fire), Tornado (hot humid protection), and even Solar ready (low watt heater and fans).Wall mount ready – Integrated into all enclosures complete with a full line of optional mounting brackets to fit virtually every mounting scenario. Easy to install – Mounts in seconds, most models include our MVP system which accepts all popular power inputs and converts it for your camera and other devices, a project life saver that makes installing quick and trouble free. Room for cameras and wireless use – Indoor wireless devices safely protected and powered inside the housing with room to spare. Easy to integrate other electronics into the enclosure with most cameras. Exchangeable exterior lens options – Clear lens for low light, tinted for schools or bullet resistant for remote extreme installs. All of our housings can accept many lens options. 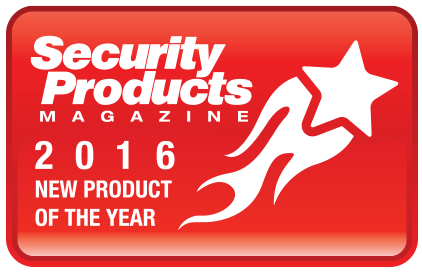 Universally compatible – Works well with all brands and sizes of security camera products, including HD broadcast cameras. 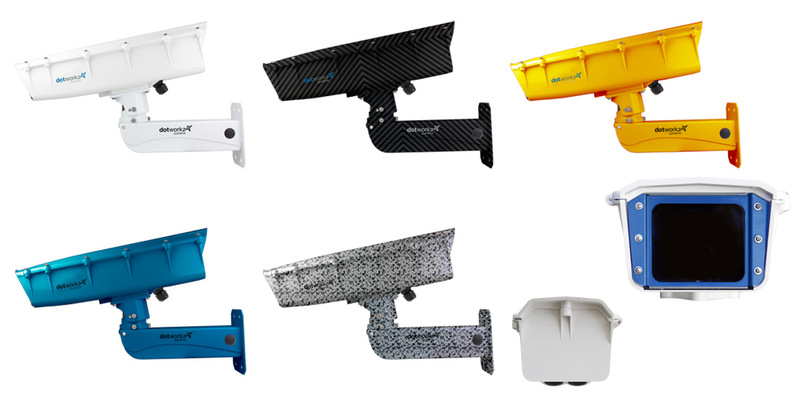 IR ready – S-Type housing comes ready to fit a wide range of IR brands and models. Low wattage solar ready kits – Get the most temperature protection possible for solar powered projects. Our Thermal Isolation System consists of four engineered barriers; specialized thermoplastic outer frame, internal foil radiated barrier (resists UV and EMI), high R value closed foam thermal blanket with a airtight IP66 grade sealed and silica dried interior. 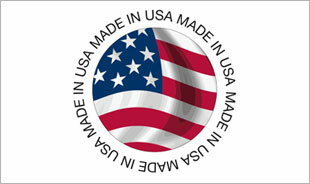 Made in the USA – Designed and hand built by people who know what security and quality mean to your project. Call (866) 575-4689 for a Complete List of Color Options, Availability, and OEM. NOTE: For all camouflage or custom dip painted options, we recommend ordering a minimum of 10 housings for each style to get the best price. At Dotworkz we are recognized as a leader in OEM. Find out how you can join our program!